I'm so excited about today's tutorial. As you may well know, I ADORE taking old things and giving them a new life. Something about a distressed patina makes my heart go pitter-patter. 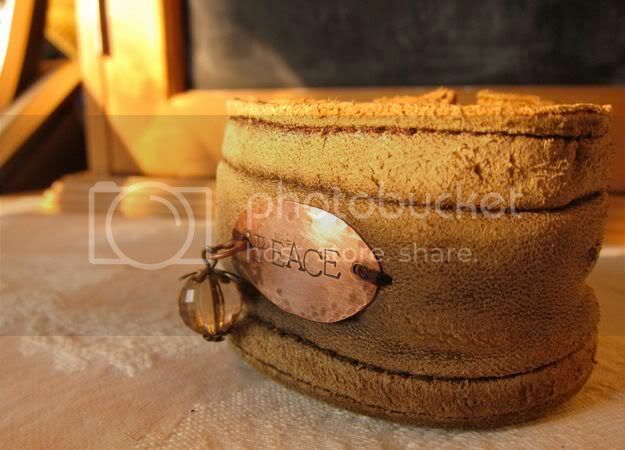 Just for fun, we will be making a fashionable cuff from what else...an old cuff! 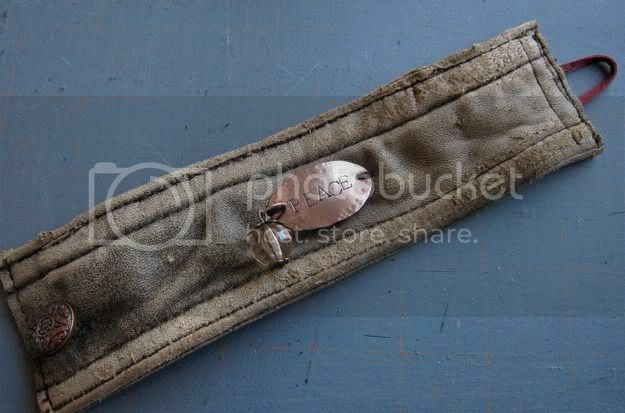 Stay tuned to the end because I have wonderful news concerning this very cuff. 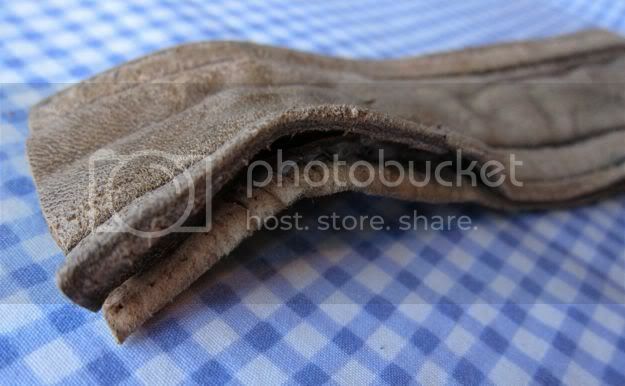 I already had this strip cut from a distressed leather bomber jacket. 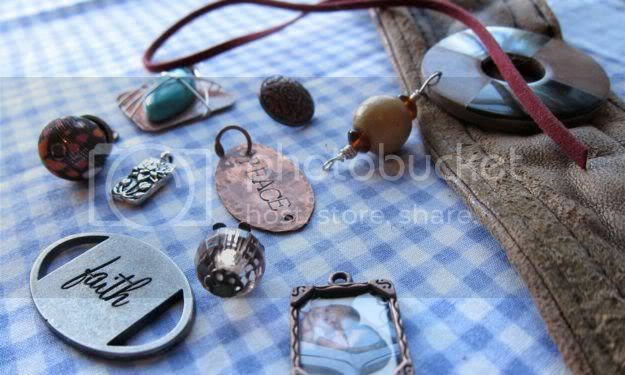 I pull out my handy dandy box of junk, I mean stuff, I mean charms and good stuff. Seriously folks, you are only limited by your imagination. I pull out several possibilities. a little charm, a raised coppery button, and some burgundy suede. I used a small jeweler's drill to get the holes in the leather. You can use a nail and hammer or if you're super strong, unlike me, you can use elbow grease. 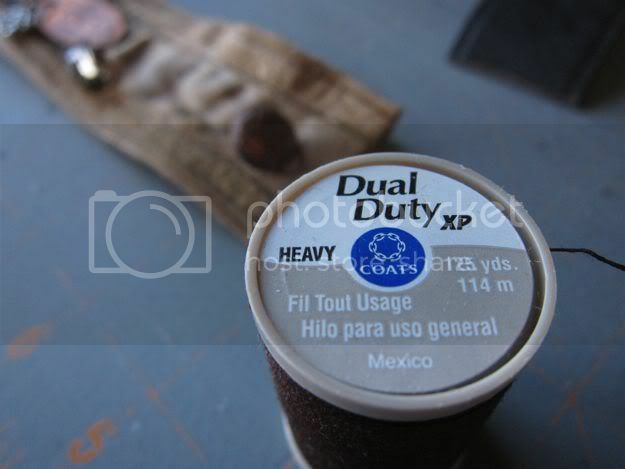 At any rate, you will need strong thread - the kind you use for leather or denim. 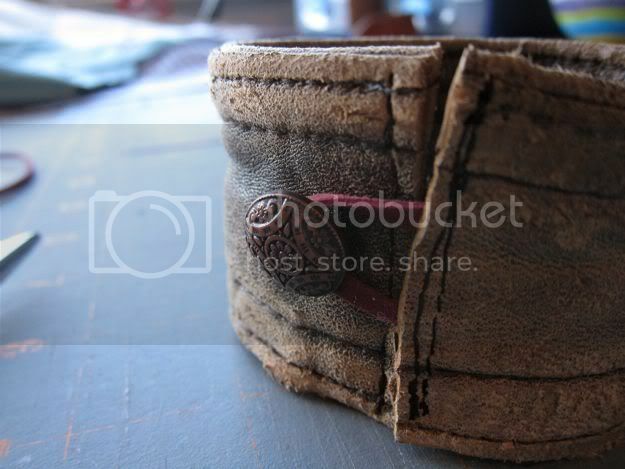 You could also use small strands of leather. I start by sewing my button to one end. Next, I cut my burgundy suede to the length I'll need. To be safe, I cut about 4 inches. 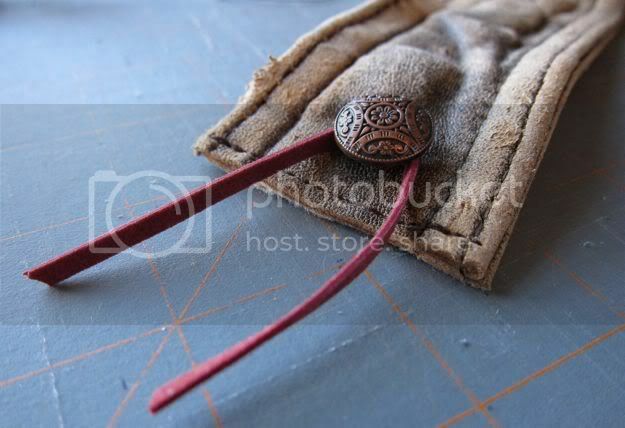 Stick the ends of the suede into the opening at the end of the leather cuff and sew. Use your widest stitch length. I actually went back after it was complete and zig-zagged over the ends to give it additional strength. 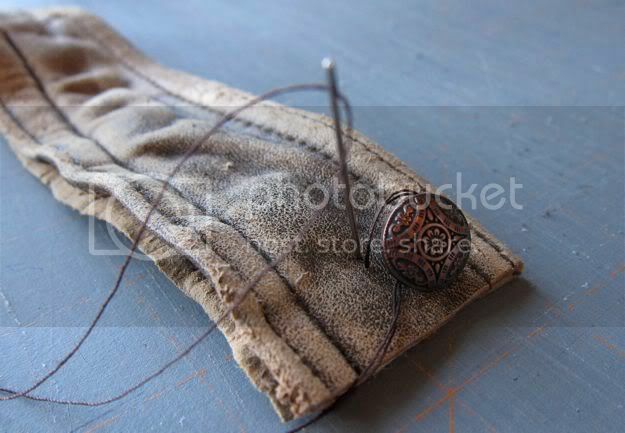 If you don't want to using a sewing machine you can certainly use a needle and thread. 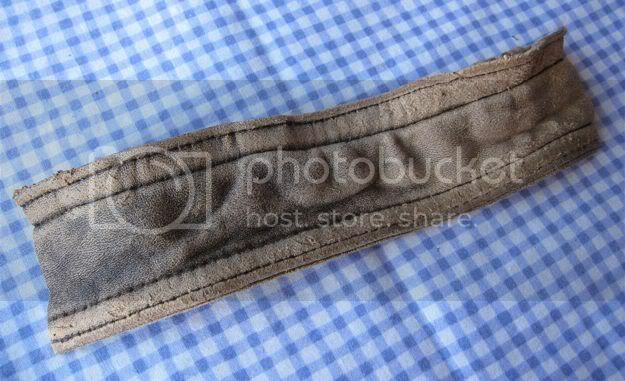 Better yet, use decorative thread! I used the heavy thread to add the charm and disc to the center of the cuff and it's done! What's my surprise? I'm not keeping today's project for myself. Nope, the offspring/part-time model didn't get it either. This cuff could be yours in about three weeks! I'll be having giveaways ALL WEEK LONG very soon for my two year blogging anniversary. So stick around and stay tuned for that. 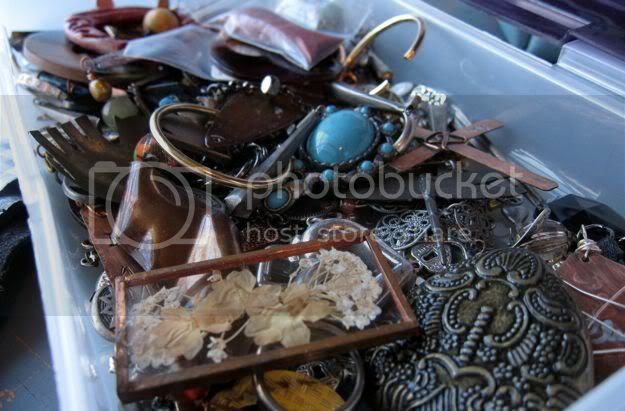 ahhh, the box of junk...I mean treasures and lovelies, mine has taken on a life of its own. Very cool cuff, made by one cool chic! now why did I never think of that?! 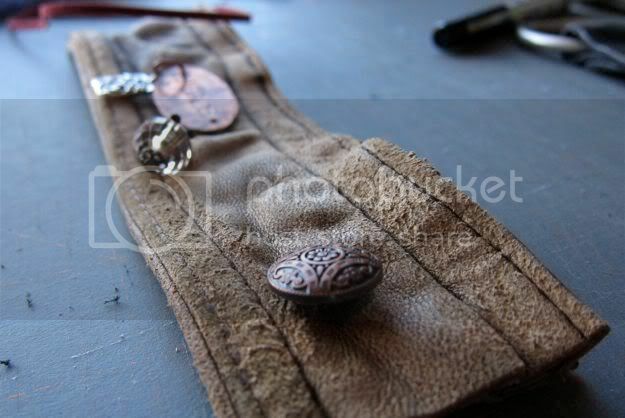 A cuff bracelet from a leather cuff... great idea - I'm thinkin' I can pull this one off. I'll let you know! You know that is just a wonderful cuff you made! And I just Love it!!! You are really Mega inventive talented. 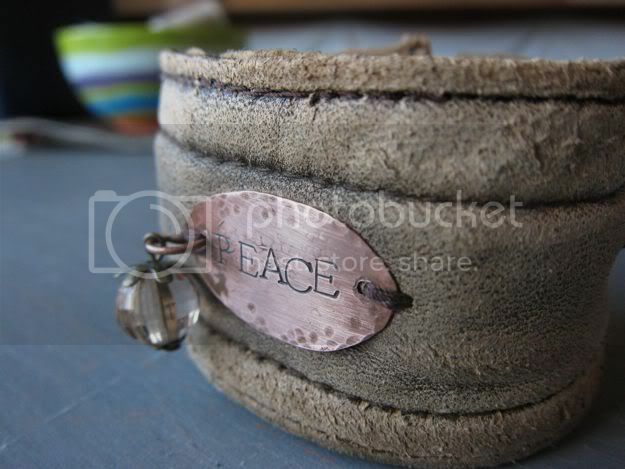 Love the cuff, and would like a few minutes alone with your handy dandy box of 'stuff'. Looking forward to more from you... have a great day. I love it. I tried to make one myself over the summer but got totally stalled. 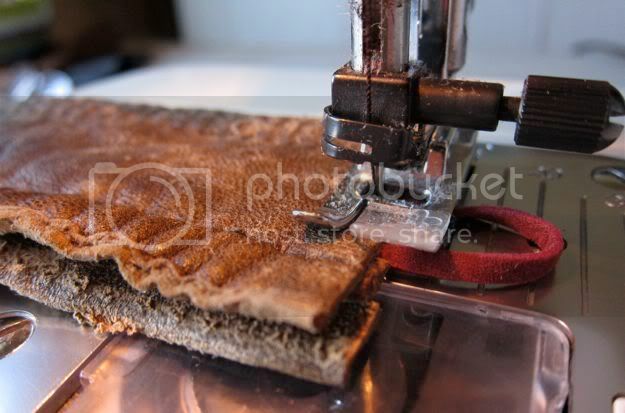 I wasn't sure if I could sew leather in a regular sewing machine...with a regular needle. Can you? Love the cuff bracelet, especially since it is from that bomber jacket! The box of lovelies was awesome - so many ideas from just one box! Love the cuff bracelet...so vintage and original! Great job! Great tutorial, you make it look so easy! I love your box of "stuff" and the cuff is beautiful! I fell in love with the cuff. Your tutorial was really well written!! I would die for your box of treasures! !